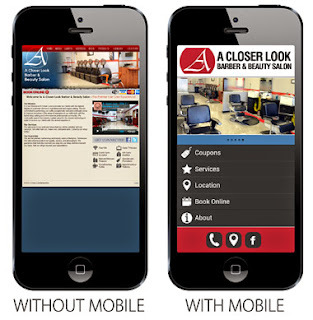 See the mobile site created for A Closer Look Barbershop by visiting this link on your phone. Customers are using mobile devices to find your competition. 95% of smartphone users have searched for local information. 61% of users call a business after searching and 59% visit the location. 90% of these people act within 24 hours. 40% have turned to a competitor's site after a bad mobile experience. It makes sense to go mobile. Cost Effective, But Not Cookie Cutter You'll get a very affordable custom mobile site, but not a cookie cutter one (like automated mobile website creators). Mobile websites are much easier to navigate on a smartphone with easy access to your services, coupons, menus, directions, and one click calling. Many clients ask for "apps", but it costs a lot more to build and maintain a app than a mobile website. AND you are going to have to convince your customers to download and install your app after you create it. For a Free Mobile Consultation.